Our service range includes a wide range of hi-tech project reports and solar power generation project reports. 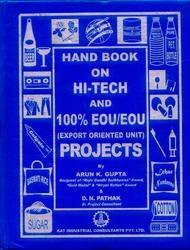 Kat Industrial Consultant Pvt Ltd. had identified some HI-Tech Project Reports for the entrepreneurs and published a book on that projects which titled "Detailed Projects Profile on Selected Hi-Tech Projects". These HI-Tech Project Reports are Aluminum Beverages cans, Beer industry, Compact Disc, Lap Top computers, Optical fibre cables, plastic I. V. Bottles, Solar Power Plant, Telephone Cables and XLPE cables. All the above projects are based on latest technologies. Each project present with uses and application, market position, manufacturing process, flow diagram. Suppliers of machinery and raw material along with cost estimation. These hi-tech projects have bright market potential and demand would be increased. This book is very informative and useful for relevant entrepreneurs. 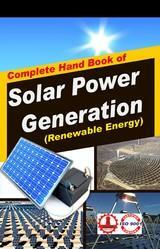 We can provide you Solar Power Generation Project Reports on the topics. Solar Power Generation Project Reports cover all the aspects of business, from analysing the market, confirming availability of various necessities such as plant & machinery, raw materials to forecasting the financial requirements. The scope of the report includes assessing market potential, negotiating with collaborators, investment decision making, corporate diversification planning etc. in a very planned manner by formulating detailed manufacturing techniques and forecasting financial aspects by estimating the cost of raw material, formulating the cash flow statement, projecting the balance sheet etc.